The GPO Brooklyn, our first 80s inspired Boom Box, sold out before Christmas and now it's back. A fully portable music system, the Brooklyn takes the 80s boombox and plugs it into the 21st century. Cassette sales role 35% in 2017. Time for a cassette revival? One that's really caught our eye is from Boomboxery.com, a forum for people who love Boomboxes. We'll be honest, we were a little nervous when they asked to review the Brooklyn. We've put a lot of love and care into this unit and this crowd knows their stuff. They're collectors and experts on 80s ghetto blasters. We're delighted with their review. It "looks cool" with a "really nice look" and "sounds even across all formats". The tape "plays very well with stable and consistent playback". Watch their review for yourself. You'll be able to get your hands on the GPO Brooklyn at the Spring Fair, from 4-9 February. It arrives back in stock from 18th February. 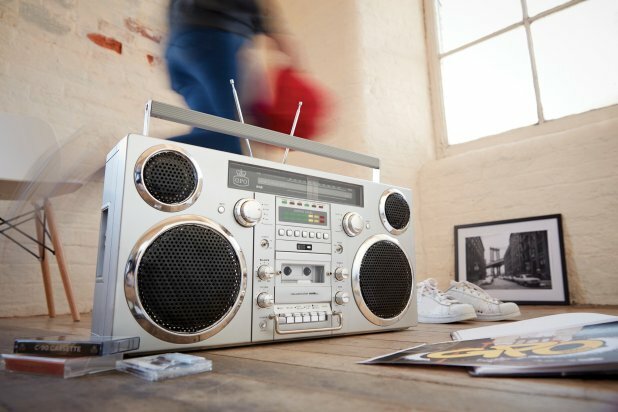 The Brooklyn is a retro boombox heavy on 80s style but plugged in 21st century tech. It plays cassettes but also has a USB port for playback and recording, CD deck, DAB and FM radio. It's Bluetooth enabled so can stream music from any compatible device. Two 40 watt speakers give the Brooklyn plenty of power, with controls for volume, balance, bass and treble. It's also fully portable - as a boombox should be - with a lithium battery that takes just one and a half hours to charge and 3-4 hours playback. It's big, measuring 60cm by 30cm, with a chrome finish and retro backlight with VU indicators.